The other day, I found myself yelling out for Calgon to come and take me away. I wanted so desperately to get away from it all. I truly thought that this stuff that you put in your bath water would come to my rescue and wash all of my cares away. But I had not the time nor the energy to go in search of the miracle bath salt, and it certainly didn’t come looking for me. Life can get overwhelming at times, but in those times, God desires to take you away with Him, to the secret place, where it’s just you and Him. He wants to pour life back into you, the kind that you long to pour into other people. I am learning that life must be lived out of the overflow. Sometimes, it’s just not flowing and you need a little time to rest, to be restored, and revived in His presence. As a writer, there is nothing worse than not having anything to say. Oh, I have lots to say, but nothing to offer that will change you. You see, when Jesus comes, He changes us, from the inside out. I want my words to bring about change. Not necessarily big changes (although that would be pretty cool), but the small ones, the ones that make you want to stop and ponder, reflect and to breath Him in deep. I write these words for Him first, and you second. My prayer is that God would give me words to say that would have a ripple effect in your heart, and bring about change. In those moments when the world seems to be moving too fast and too loud, I cry out for Him to take me away. I’m going to run away with Him for a bit. Oh I’ll be here, and there, but the deeper things He has yet to reveal to my heart. And when He does bring the words, they will change me, from the inside out, and hopefully you as well. What is it that has you crying out for Him to take you away from today? Take His hand and go with Him. I promise you He’s so much better than Calgon! 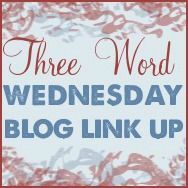 Linking up with the beautiful Beth today for Three Word Wednesday. Beautiful Barbie. funny this Psalm was definitely my refuge today. Your post is just confirmation of the Words. Thanks for stopping by Maria. Loved your post. Oh yes…take me away! This is what I need…quiet time with Him. I feel such a need to let him refresh this weary heart. I keep waiting for everything to slow down but I need to stop waiting and be still with Him. And girl… your words do bring about change in my life. You continue to be such a blessing to me. I’m so very grateful God brought us together in this blogging world. So many times the weary and worn mom in me begs for Him to take me away! And I am so thankful for that because I have a God I can approach- and I know He’s listening. What a blessing! I keep hearing Him say, “Come away, My beloved, come away!” I love that He pursues us and never stops. Love you my friend! My prayer lately has been, “Come, Lord Jesus.” Come take us all away to that eternal home in the sky, away from all of the turmoil and strife down here. Oh Dayle, I long for heaven so intensely some days. But I am thankful for the grace He gives to endure our time here on this earth. I’ve definitely had my Calgon moments lately. But less of me means more of God, I’ve been depending on Him so much that I almost (almost) don’t want the storm to pass just bc I have enjoyed the closer fellowship with him. I know when things are going like they are supposed to I’m not as needy and dependent. That secret place is where I want to stay, always. That’s so true. When there are storms looming, we tuck ourselves under the shadow of His wing, stay tight in Him. Longing to steal away with Him! Thanks for stopping by Alecia! Love this post. Yes, yes, yes. This world of ours is so far from Him, I just want to remain in Him always. Me too Dalia! Me too!